Wayne Gretzky is 50 today. It's pretty crazy to think about his age and it makes me feel pretty old. I can still remember watching him play in the 1980's and even had his blonde curly locks flowing out of my hockey helmet just like he did. Gretzky is the only player to reach 200 points in a season. He did it 4 times in 5 years between the 1981-82 and 1985-86 seasons maxing out at 215. Gretzky was also a talented track star and a baseball player. In 1971 the 10-year-old athlete said: "If I couldn't play hockey I'd like to play baseball with the Oakland Athletics and Vida Blue." Turned out he could swing the lumber. In 1983-84, Gretzky set a record with a 51 game point scoring streak. During that streak, he had 61 goals and 92 assists for 153 points. That is exactly three points a game. That is amazing considering that he had a separated shoulder for much of that streak. After that streak ended, he took 6 games off to rest his shoulder. Gretzky was born and raised in Brantford, Ontario. Gretzky honed his skills on their backyard rink and his dad Walter would coach and set up drills for him. 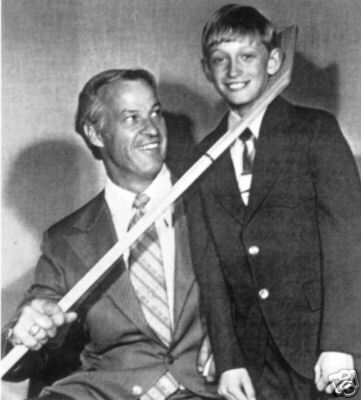 ﻿﻿Spectators and other hockey parents would try and steal Gretzky's sticks at tournaments when he was 12 years old (Gordie Howe's true intentions). He played one year in the Ontario Hockey League at the age of 16, with the Sault Ste. Marie Greyhounds. This is when Wayne started to wear number 99. He wanted to wear number 9, but it was already taken by an older player. At the age of 10, Gretzky scored 378 goals in 85 games. Only two players besides Gretzky have ever had 100 assists in an NHL season. Mario Lemieux did it once with 114. 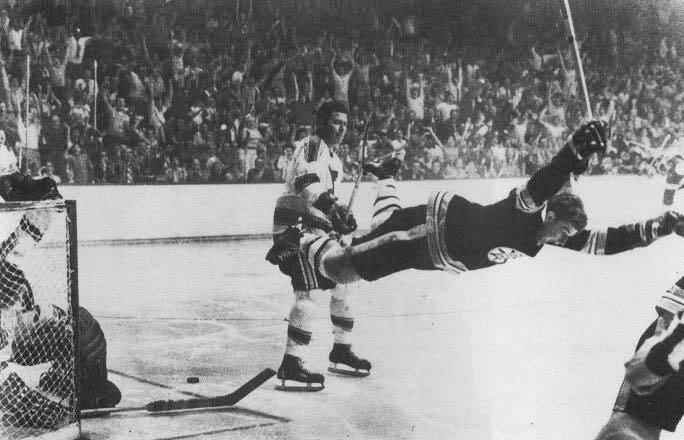 Bobby Orr also did it once with 102. Gretzky did it 11 times, all consecutively. During that streak, his best season (1985-86) he had 163 assists and his worst season (1989-90) he had 102. He holds the top eight spots in the record books for most assists in a season. He won nine Hart Trophies, the NHL's most valuable player award, and eight of these were awarded in consecutive years from 1980-1987. In fact, Gretzky holds the record for most MVP awards of any player in American professional sports. Gretzky married American actress Janet Jones in 1988, They have 5 children: Paulina, Ty, Trevor, Tristan, and Emma. When he was 13, Gretzky was already a national icon and was interviewed by CBC, pretty crazy to hear his voice in 1974. In his second season, he broke the NHL record for most points (152) held by super star Phil Esposito with 164. In doing so, he also became the first player to average more than two points a game in the modern NHL. Mario Lemieux is the only other player in the NHL to do that. 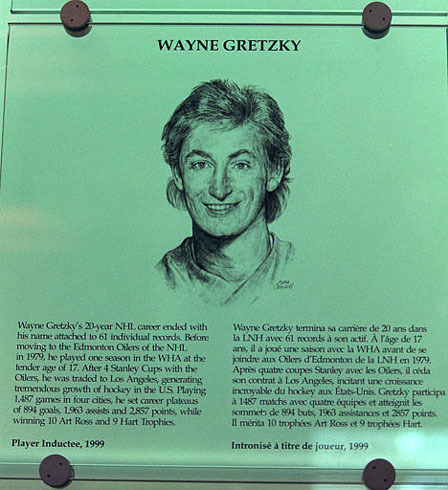 Gretzky has a star on the Canadian Walk of Fame. In 1989, he broke Gordie Howe’s record for most points in a career. It took Howe 26 years to get 1850 points. It took Gretzky only 10. Gretzky averaged over 180 points a season for those 10 years. His average was better than anyone else’s best (except for Mario Lemieux. Lemieux achieved over 180 points once in his career). Gretzky won Olympic Gold as Executive Director-Manager in 2002. Gretzky won the NHL Plus/Minus Award (best plus-minus rating) -1982, 1984, 1985, 1987. Gretzky was on the NHL First All-Star Team-1981, 1982, 1983, 1984, 1985, 1986, 1987, 1991. Gretzky's jersey number 99 is retired league-wide by the NHL. 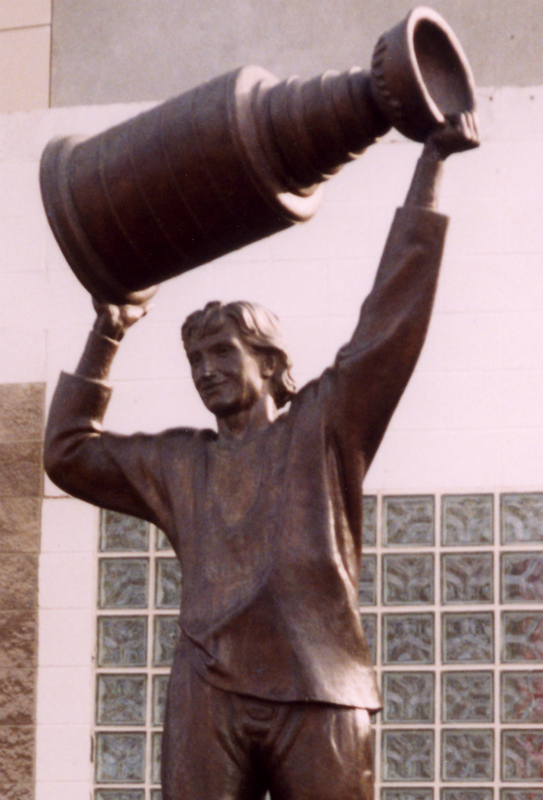 Gretzky won the Art Ross Trophy (scoring champion) — 1981–87, 1990, 1991, and 1994. Gretzky hosted Saturday Night live in 1989. This re-inforced the notion among the public that he had better not quit his day job to pursue an acting career. ﻿Gretzky lent his likeness to a 1992 cartoon show, Pro-Stars. It also stared Michael Jordan and Bo Jackson. ﻿The trade that rocked Canada and Edmonton. 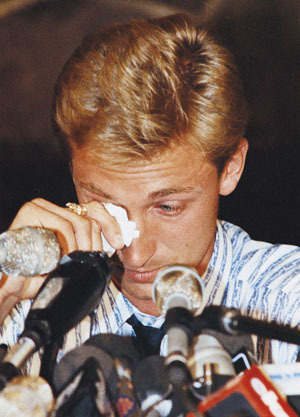 Gretzky was traded to the Los Angeles Kings. The main reason for the trade was that Oilers owner Peter Pocklington needed money as his other business ventures were not doing that well. In the deal $15 Million was heading directly to Pocklington's pocket. The best Wayne Gretzky quote - "100% of the shots you don't take, don't go in." Gretzky was named an Officer of the Order of Canada on June 25, 1984, during his heyday with the Edmonton Oilers, for outstanding contribution to the sport of hockey. His father, Walter, became a Member of the Order of Canada 23 years later on December 28th, 2007. Gretzky was recently promoted to the highest Order of Canada - Companion. Gretzky has scored the magical 50 goals in 50 games or less three times in his career, more than anyone else. 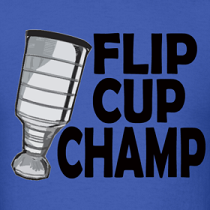 Brett Hull did it twice. Gretzky was inducted into the Hockey Hall of Fame on November 22, 1999. Since Wayne Gretzky’s retirement, two of his records have fallen (15 regular season overtime assist now held by Mark Messier with 18 and 12 All-Star Game assists now held by Joe Sakic with 16) and he has gained one record, leaving him with a new total of 60 official records. Gretzky won 4 Stanley Cups in 1984, 1985, 1987 and 1988. Wayne Gretzky finished his career with a 1.921 points per game average. Only Mario Lemieux, then retired, had a better points per game average at that time. Lemieux since came out of retirement in 2000 and played until the 2005–06 NHL season. Lemieux's points per game average has dropped to 1.883 before retiring once again midway through the 2005–06 season. This gives the record back to Gretzky. Gretzky won the Lady Byng Memorial Trophy (most gentlemanly player) -1980, 1991, 1992, 1994, 1999. Gretzky played on four different NHL teams over a 20 year period: the Edmonton Oilers, the Los Angeles Kings, the St. Louis Blues, and the New York Rangers. Wayne Gretzky did a great deal of commercials over his career. Some great ones are this 7UP one with brother Keith and Wayne delivering Domino's. Gretzky has the record for most points in the playoffs, career: 382 -- 122 goals and 260 assists. During the 1994-95 lockout, Wayne Gretzky gathered some friends to tour Europe as the Ninety Nine All Stars. Wayne has the highest goals-per-game average in one season: 1.18 in 1983–84, 87 goals in 74 games. Gretzky scored 50 goals in 39 games. Wow. Gretzky has the most regular season goals with 894 in 1,487 games. 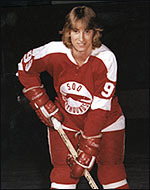 Gretzky has the record for most goals in one season, including playoffs with 100, in 1983–84, 87 goals in 74 regular season games and 13 goals in 19 playoff games. Gretzky became known for setting up behind the net, an area that was nicknamed "Gretzky's office" because of his skills there. If you took away all of Gretzky’s goals, he would have still won the Art Ross Trophy for leading scorer four times and would still have more career points than anyone else. His 1963 career assists are better than Gordie Howe’s 1850 and Mark Messier’s 1887 points. Gretzky won the Art Ross Trophy 10 times (scoring champion) -1981, 1982 ,1983 ,1984, 1985, 1986, 1987, 1990, 1991, 1994. Wayne Gretzky's mint condition rookie card sold for $80,000 in 2006. There is only one card with the mint grade of 10 known of. 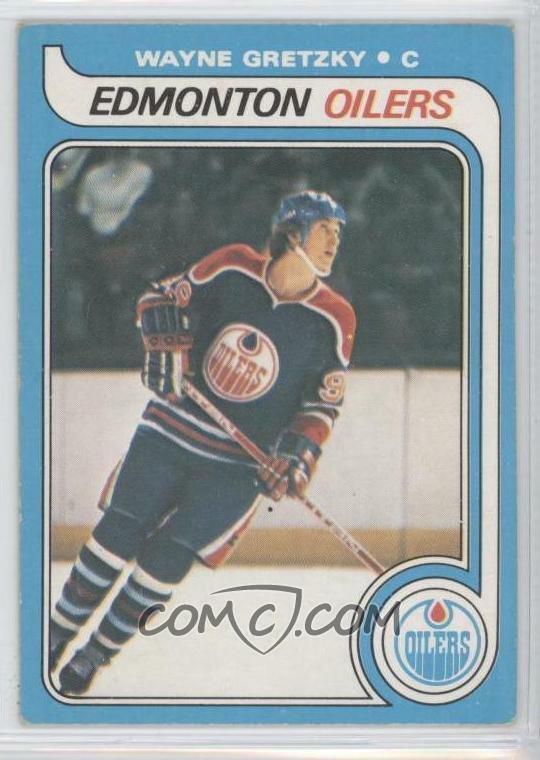 Other lower graded Gretzky rookie cards sell for around $1000. There is still a statue of Wayne Gretzky outside the Edmonton Oilers Rexall Arena. Gretzky has the record for most 100-or-more point seasons with 15. Gretzky's brother Keith Gretzky was drafted in the 3rd round by the Buffalo Sabres in the 1985 draft. He never made the NHL but did play in the AHL and IHL until retiring in 1993. The youngest Gretzky brother Brent, who is 11 years younger than Wayne was drafted by the Tampa Bay Lightning in 1992. He ended playing 13 games in the NHL and scoring 1 goal with 3 assists. In 1487 NHL games. Wayne Gretzky amassed 2857 points. Growing up in a hockey household, Wayne Gretzky's Above and Beyond was a staple on our TV. My family shares many Gretzky memories, but I will never forget watching his final NHL game together and all of us tearing up. What is your favourite Wayne Gretzky moment? Use to love watching Gretzky. He changed the way the game was played. Can't believe he is 50. I loved the commercial with Wayne and Keith. "I taught him everything he knows"
gretzky did not with 4 stanley cups, why woul dyou lie? Gretzky won 4 cups... is this guy drunk? he can't even write. Vince Vaughn made his head bleed!